Check out steps in Magento 2 are such undeniably remarkable upgrades compared to Magento Buying something in a physical store. You pay the money and get the goods if not mention to bargaining and picking also to make the actions more exact to be in real life. Buying something online, the rule “money for commodities” remains but it happens in an entirely different story, especially the vital steps of checkout that requires customers go through a whole process to fill up some personal information before their orders are recorded, and shipments are initiated. The nature of e-commerce, as we all know, is to use technology to purchase things in a more convenient and time-saving way, so regardless of attractive offers on your stores, it comes to the doom of your sales once customers leave their carts abandoned on finding checkout steps too intricate or not time-saving at all. To be one of the most popular E-commerce platforms, Magento 2 surely got it right with checkout section reworked to simplify the process but enhance customers’ experience at the same time. In Magento 1, when a customer proceeds to checkout, he will be shown 6 steps in to provide needed information before completing placing an order, including Checkout Method, Billing Information, Shipping Information, Shipping Method, Payment Information and Order Review. The order of these steps must be strictly followed through the process, and you can not go to the next step if the current one has been filled up. It may make people feel somehow annoying of having to give too many details to buy something simple. 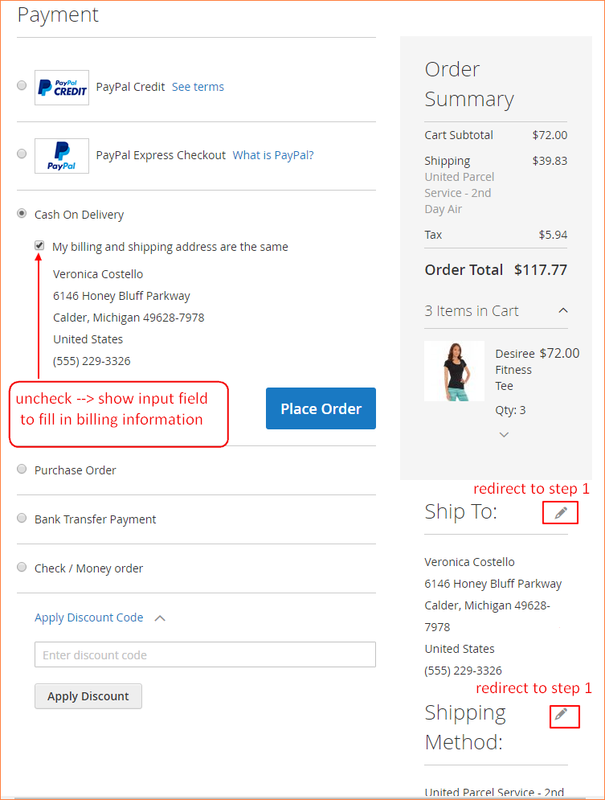 Now in Magento 2, all of the Checkout processes narrow down to 2 steps: Shipping and Review & Payments which are displayed in two separate pages. Though necessary information required doesn’t change much, but the new display style is significantly neater replacing the information-hungry form before. Besides, the first step to choose Checkout Method in Magento 1 has been eliminated because it may cause the fact that customers feel confused or even discriminated between registered accounts and guests. In the market, there are also free modules to solve this problem in Magento 1, and Magento 2 has quickly applied it to its default settings. It automatically assumes guest checkout at the first time and has account recognition via email. However, if you have already had an account but still want to check out as a guest, that’s fine. 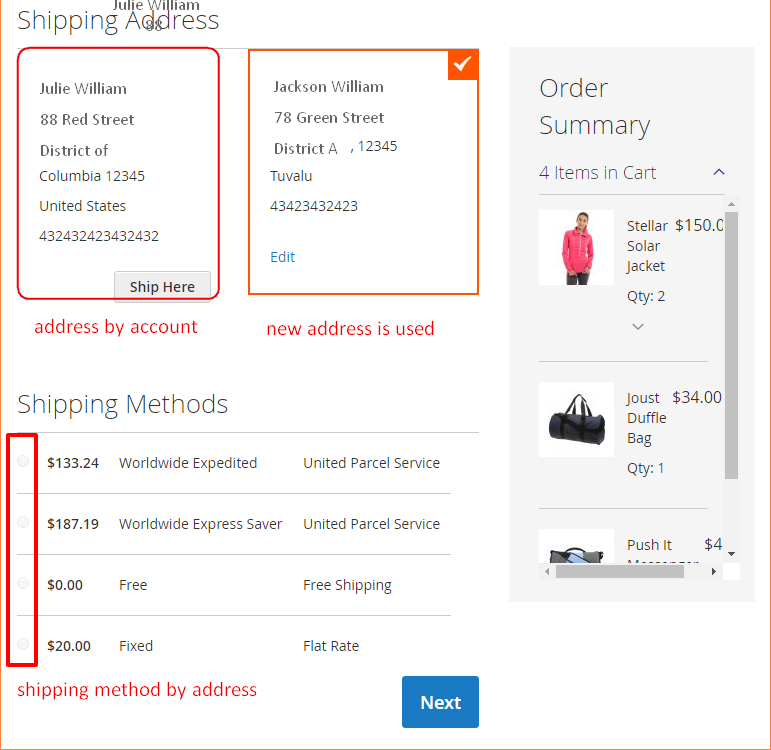 This step in Magento 2 combines step 3 (shipping information) and step 4 (shipping method) from Magento 1. Moreover, a summary section is added to help customer easily verify the order. With logged in customers, the shipping address will be updated with the information in account information. Customers can add new shipping addresses but can’t log out. This section displays product information including name, image, quantity, price, and other options like size and color so that customers can conveniently verify what they are ordering. However, in case of ordering the wrong thing, this section does not allow them to edit product options or remove it. On the other hand, relevant information like subtotal, tax and shipping fee still not be added here to be seen. On the smaller screen (like when using smartphones), order summary section will be hidden and can be opened by hitting shopping cart icon. This step includes 3 sections: payment method, apply for discount code and order review. For each method, there is a Place Order button displayed. Here you may insert the discount code that you get, and it is applied to the order immediately. 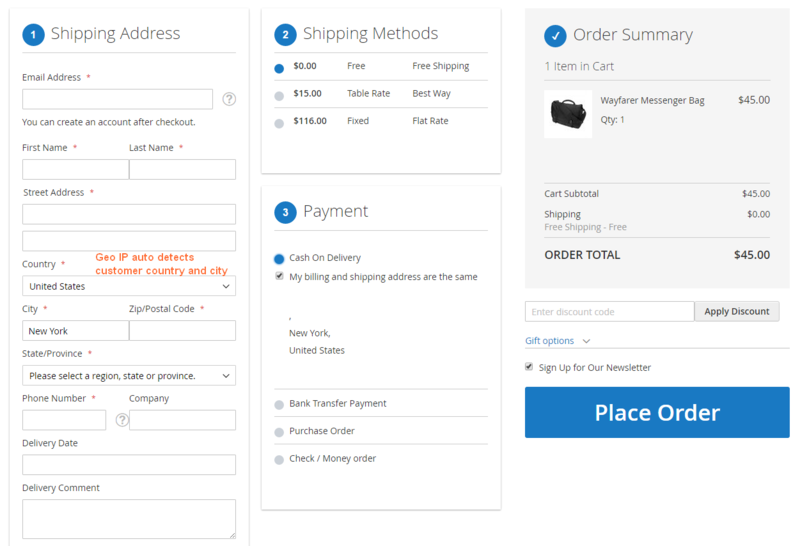 Just like in the Shipping step, an order summary section is shown in this step with a product name, quantity, price, image, and options with no capability to edit or remove them. But information like cart subtotal, tax, shipping fee, discount now is added for a convenient overview. Also, there is a review section of shipping address, shipping method with Edit button to redirect back to the first step. About responsive feature to smaller screen, order summary section will be hidden and can be opened by hitting shopping cart icon. + Add more fields into the checkout page such as a discount code box, gift message option and newsletter subscription. With the help of One Step Checkout for Magento 2, customers can checkout faster than frequently, and as a result, store owners can effectively reduce cart abandoned rates and increase conversion rates. If you are still confused about this writing, please contact us for more explanation and detailed instructions. We contain talented developer in Web development and Magento extensions which are always willing to support you.